Researchers identified 7 planets circling the star TRAPPIST-1 this year, three of which might be able to keep liquid water on its surface. 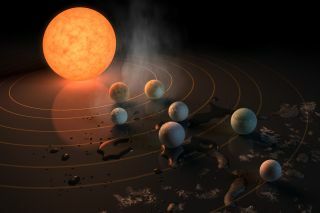 Scientists spotted seven Earth-size alien planets orbiting one dim red star this year, and a lot of other strange exoplanets — ranging from an Earth-size ice ball to the hottest planet ever found and many more, plus a star that seems to have gobbled up something like 15 rocky worlds. Read on for 2017's most unusual, fascinating and potentially livable exoplanet finds. Astronomers also discovered the hottest planet found to date in 2017 — the Jupiter-like KELT-9b. The planet orbits so close to its star, KELT-9, that it completely circles the star in 1.5 days, and it is tidally locked to the star — meaning the same side is always facing inward. Researchers spotted the planet passing in front of its star with the Kilodegree Extremely Little Telescope (KELT) at Winer Observatory in Arizona. KELT-9 is larger and hotter than the sun, and its constant radiation makes KELT-9b's atmosphere balloon up until it's half the density of Jupiter. Someday, it may evaporate the planet entirely, researchers said — or, if the planet has a rocky center, boil it down to just the core. Observation with the Hubble and Spitzer space telescopes, as well as the future James Webb Space Telescope, could reveal the planet's ultimate fate. The alien world Ross 128b, first spotted this year with the High Accuracy Radial velocity Planet Searcher (HARPS) instrument at the La Silla Observatory in Chile, is just 11 light-years from Earth. And although it orbits much closer to its star than Earth does to the sun, the star is cool enough that it could still lie in the habitable zone, if it has a thick enough cover of clouds to reflect away some of the light. Ross 128b is the closest Earth-mass planet potentially in the habitable zone of a quiet star, scientists say — our nearest neighbor, Proxima Centauri, blasts out powerful flares to roast its potentially Earth-size planet, Proxima b. Using Google's machine-learning techniques, scientists found an eighth planet orbiting the star Kepler-90, marking the second eight-planet star system ever found (after Earth's system, which has eight official planets. Kepler-90i is located 2,545 light-years from Earth, it's likely rocky, and it's the third world from its star — but unlike Earth's 365.26-day orbit, it circles its star in 14.5 Earth days, and is much too close and hot for liquid water to remain on its surface. The planet's average surface temperatures could reach 800 degrees Fahrenheit (430 degrees Celsius). The machine-learning program, which also found a planet around another star, made the call by analyzing star-dimming data from the Kepler Space Telescope. Researchers beamed a radio message to the nearby GJ 273 system, which boasts two planets (one potentially in the habitable zone). Scientists and artists dashed off a message to the nearby dwarf star GJ 273, which hosts two recently discovered planets. One of them, GJ 273b, could be capable of supporting life — and the system is just 12.36 light-years from Earth. Team members at METI (Messaging Extraterrestrial Intelligence) International sent a message toward the star using a telescope in Norway, including a scientific and mathematical "tutorial" along with 33 short musical compositions by artists involved with the Sónar Festival in Barcelona. If the message were received, humans could expect a response in under 25 years. The roughly Earth-size planet 06-OGLE-2016-BLG-1195Lb is a giant iceball under the weak shine of its star. A newfound alien world 13,000 light-years away with a mouthful of a designation — OGLE-2016-BLG-1195Lb — has a lot in common with our planet: It's about the same mass as Earth, and orbits at about the same distance from its star as Earth does from the sun. But while the sun's golden glow warms Earth to livable temperatures, OGLE-2016-BLG-1195Lb's star (OGLE-2016-BLG-1195L) is tiny and dim, leaving its planet as a frigid ice ball. Researchers discovered the planet when its star happened to pass in front of another star monitored by the Optical Gravitational Lensing Experiment (OGLE) survey program. Using data from NASA's Spitzer Space Telescope and the Korea Microlensing Telescope Network, the researchers were able to use the way the star bent the light of the background object to deduce that the star had a planet, calculate its mass and how far it orbits from the star. It is the lowest-mass planet ever found through that technique, called microlensing. Researchers say the star Kronos may have engulfed enough rocky planets to equal 15 times Earth's mass. Our last exoplanet mention has to go to the star Kronos, which — although researchers didn't find any planets around it — seems to have a voracious planetary appetite: Comparing its composition to that of its companion star, researchers found that the star may have gobbled up as much as 15 Earth masses' worth of rocky planets over the course of its life. Researchers found an abundance of rock-forming minerals like magnesium, aluminum, silicon, iron, chromium and yttrium in Kronos' outer layers, but much less of volatile compounds like oxygen, carbon, nitrogen and potassium that are generally found in gas form. Metal-rich stars usually have all of them, suggesting that Kronos may have gotten its metals by swallowing rocky planets.